Kyle Bennett’s first-half goal was cancelled out by Kevin Luckassen header on the hour mark, as Rovers had to settle for a point at the Mem. Bennett scored the opening goal of the game, midway through the first-half as the winger kept his calm to convert from close-range when an Ellis Harrison attempt was rebounded into his path. Rovers looked good value for the lead into the second half, as Liam Sercombe had a goalbound shot cleared off the line by Jordan Turnbull, but on the sixty-minute mark substitute Kevin Luckassen headed home with his first touch of the game to ensure the points were shared. Heading into the contest, Rovers boss Darrell Clarke opted to make two changes to the side that secured victory at MK Dons last weekend. The return to the starting XI of Stuart Sinclair meant that Luke Russe wasn’t included in the matchday squad, with the other change in the starting line-up coming in the shape of Rory Gaffney, who replaced Byron Moore. Northampton Town, on the other hand, named an unchanged starting line-up, including new signing Kevin Luckassen amongst the substitutes for their trip to the Mem. Rovers started brightly and looked to create early chances on goal with a prolonged spell of possession deep inside the final third. Rory Gaffney took advantage of unprecedented time in a wide position to deliver a threatening cross that was ushered away by the Northampton defence, just as Ellis Harrison had advanced into a position to attack the ball. It was Sam Slocombe who was the first goalkeeper who was called into action. Chris Long’s adventurous run had seen forward break into the Rovers penalty area. Long was quickly pursued by Rovers skipper Tom Lockyer, who managed to force the striker out wide, from where he delivered a low-effort across the face of goal that was easily gathered by Slocombe. The home side continued to produce high-quality deliveries into the box as the first half progressed. Kyle Bennett from a central position produced a threatening cross that picked out the run of Ellis Harrison, with Ash Taylor in the Northampton defence forced to head the ball over the crossbar to elevate the danger. The chance was quickly succeeded by a long-range volley from Liam Sercomnbe that clipped the crossbar, with O’Donnell seemingly beaten. The majority of the first half possession went the way of the home side, as Rovers strung a passage of play together that eclipsed twenty interchanges before Joe Partington aimed a threatening cross into a populated penalty area that was edged away by Northampton defence. 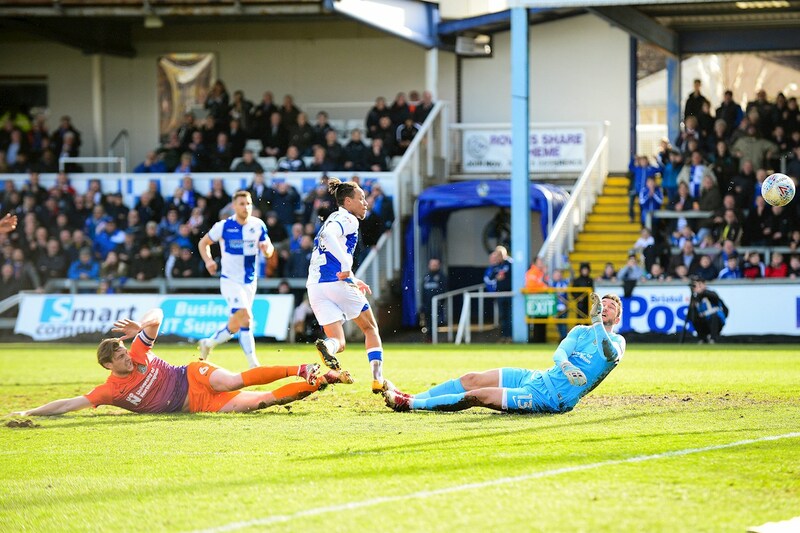 There was an anxious moment for Rovers when Chris Long snatched possession of Tony Craig deep inside the Rovers half. The Northampton striker broke towards goal and summoned Sam Slocombe into making a save, as the Rovers shot-stopper was able to divert the rebound out of the advances of John Joe-O’Toole in the process, as the Rovers defence recovered to remove the imminent danger. A steady flow of changes for Rovers continued throughout the first-half. After holding possession wide out right, Joe Partington feed a pass to the feet of Rory Gaffney, who had a sight of goal on the edge of the area. The striker shaped up to shoot and opted for power, with his effort flying narrowly wide of the upright. The deadlock was broken just after the half-hour mark, as Rovers converted their chances into the opening goal of the contest. 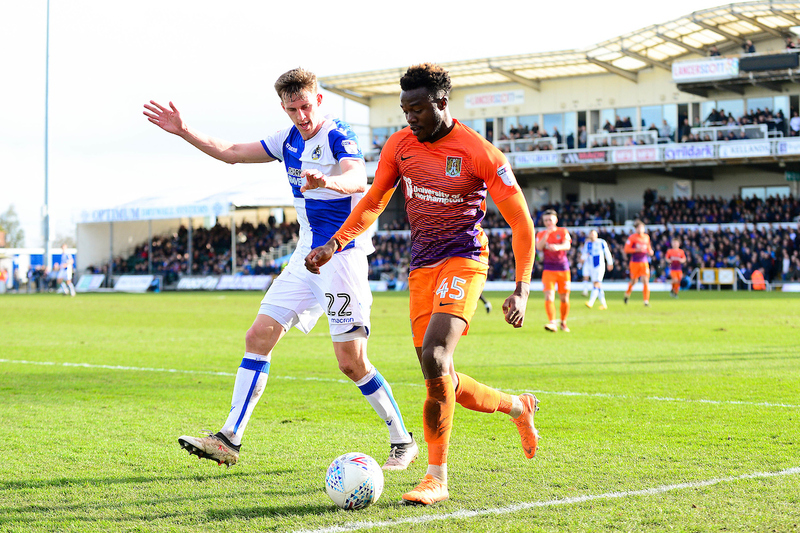 The move started when Ellis Harrison was able to control a bouncing ball inside the Northampton area and was able to turn swiftly to produce a driven effort towards goal. Harrison’s shot was pushed away by O’Donnell, but the rebound fell kindly for Kyle Bennett, who kept his nerve to lift a chipped finish over the Northampton ‘keeper who was stranded on the floor. Following the interval, Rovers again were quick out of the block from the restart. Goalscorer Kyle Bennett almost turned provider for Liam Sercombe, as the winger produced a delicate touch to deflect the ball to Sercombe. The midfielder had the goal at his mercy and managed to direct a side-footed finish out the of the reach of O’Donnell, but his shot was blocked on the line by Jordan Turnbull. Bennett sustained his presence in advanced positions and was a constant outlet for Rovers. On the hour mark, the winger managed to break to the edge of the Northampton before digging out a pass to Ellis Harrison, with the delivery touched away from the forward by a covering challenge from Ash Taylor. The visitors pulled back level shortly, as substitute Kevin Luckassen, who was making his debut for the Cobblers, scored with his first touch of the game, after rising the highest in the area to head home from a Brendan Moloney cross. 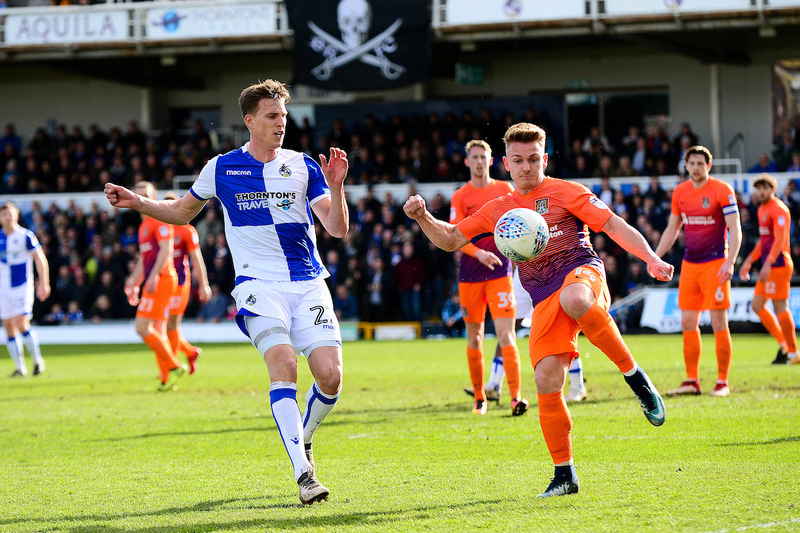 Rovers had the chance to respond instantly, as a ball into the Northampton area was knocked down by Tom Lockyer into the path of Ellis Harrison. The striker set himself to attack the ball on the volley, but off-balance sent his close-range finish over the crossbar. The visitors were reduced to ten men with fifteen minutes left on the clock, as Matt Crooks picked up a second yellow card and was shown his marching orders for a foul on Stuart Sinclair. 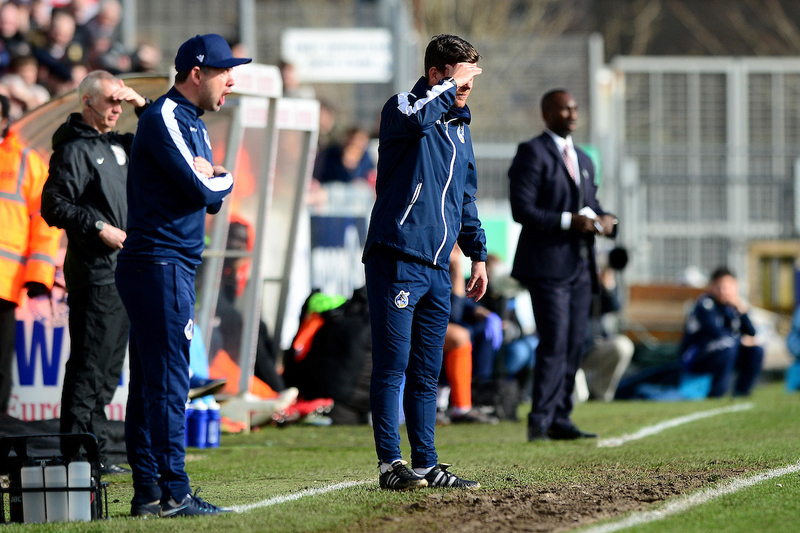 The man advantage saw Darrell Clarke make an immediate double substitution, as both Byron Moore and Dom Telford were introduced in search of a late winner – but an effort from range from Chris Lines was easily held by O’Donnell inside the closing ten minutes, as the Northampton ‘keeper also produced a save down low to deny Dom Telford, as Rovers had to settle for a point. Rovers XI: Sam Slocombe (GK), Joe Partington (70′ James Clarke), Tom Lockyer (c), Tony Craig, Lee Brown, Chris Lines, Stuart Sinclair (75′ Byron Moore), Liam Sercombe, Kyle Bennett, Rory Gaffney (75′ Dom Telford), Ellis Harrison. Subs: Adam Smith (GK), Tom Broadbent, James Clarke, Bernard Mensah, Byron Moore, Tom Nichols, Dom Telford. Northampton XI: Richard O’Donnell (GK), Brendan Moloney, Ash Taylor, Sam Hoskin, Chris Long (78′ Shay Facey), John-Joe O’Toole (45′ Hildeberto Perreira), Matt Crooks, Matt Grimes, Jordan Turnbull, Joe Bunney, Gboly Ariyibi (59′ Kevin Luckassen). Subs: David Cornell (GK), Leon Barnett, Daniel Powell, Shaun McWilliams, Shay Facey, Hildeberto Pereira, Kevin Luckassen.